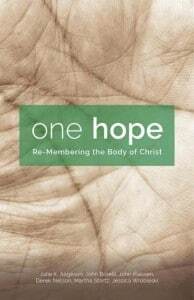 Last year we worked with Augsburg Fortress and Liturgical Press to produce the “One Hope” book in a 3 day Book Sprint. The essays in One Hope explore experiences and activities that Catholics and Lutherans share and that connect to the living of their faith in embodied ways: breathing, eating, singing, forgiving, serving, and dying. One Hope will serve as a welcome resource for adult faith formation and parish discussion groups made up of Catholics, Lutherans, or members of other Christian denominations. “Due to the deeply collaborative nature of the process, the One Hope project really seemed to embody and actualize the kind of practical ecumenism that the book describes. Through entrusting ourselves to one another—not only in the intellectual work we did together that week, but also through our shared meals and prayer—I think we were able to produce something that was truly inspired and more than the sum of its parts. It was a unique privilege to be a part of this project and to experience the joys of genuine collaboration and fellowship and to benefit from the wisdom of my co-participants,” says Jessica Wrobleski, assistant professor of theology and religious studies at Wheeling Jesuit University in West Virginia, and One Hope contributor.